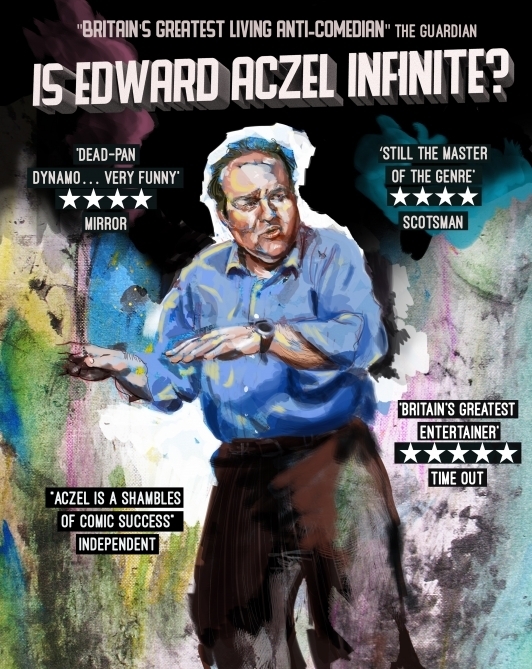 Ed Aczel is the ultimate anti-comic, but is he Infinite? Have you ever thought: who am I? Is it all just a dream? Is time constant or variable? Is it only possible to imagine the infinite? No, me neither. ‘Dead-pan dynamo… very funny' ★★★★ (Mirror). ‘Still the master of the genre’ ★★★★ (Scotsman). Anyway, we live in uncertain times and Ed's house is built on shifting sand. So, it calls for some navel-gazing. It'll probably be fine – it might even work… there’ll definitely be jokes. And more stars than you can shake a stick at (ideally). ‘Dead-pan dynamo… very funny' ★★★★ (Mirror). ‘Still the master of the genre’ ★★★★ (Scotsman).